Hello and welcome to my blog! 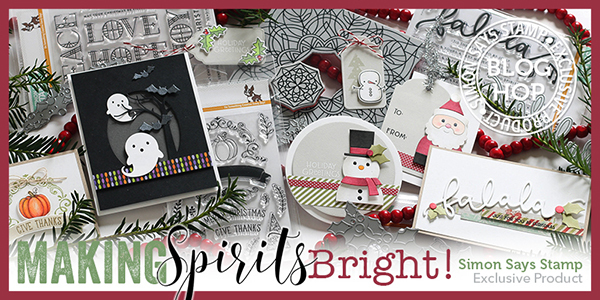 I am so happy to be a part of the Simon Says Stamp Making Spirits Bright Holiday Blog Hop to celebrate the release of the latest Making Sprits Bright line. You should have come here from the very creative Kelly Latevola. Don't miss all the inspiration along the hop, and of course there are prizes to be won too. 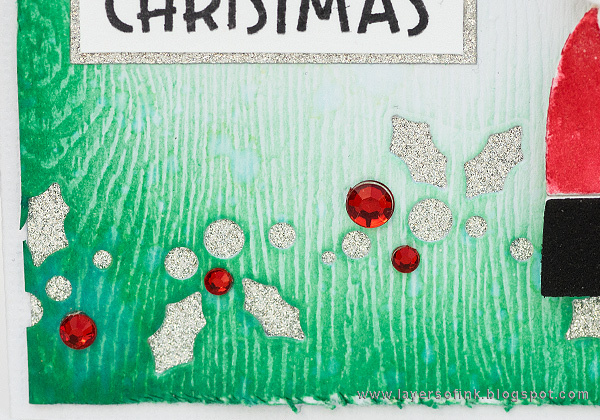 Making Spirits Bright is a really big release is full of fantastic stamps, dies, sequins, and envelopes, for holiday crafting. There are products for Halloween, Thanksgiving and Christmas. 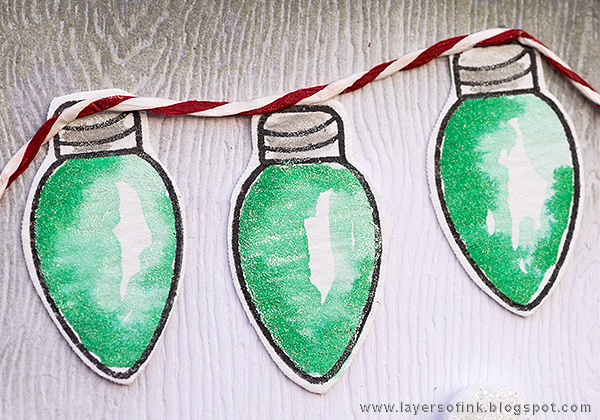 In my post, I will be sharing Christmas projects. 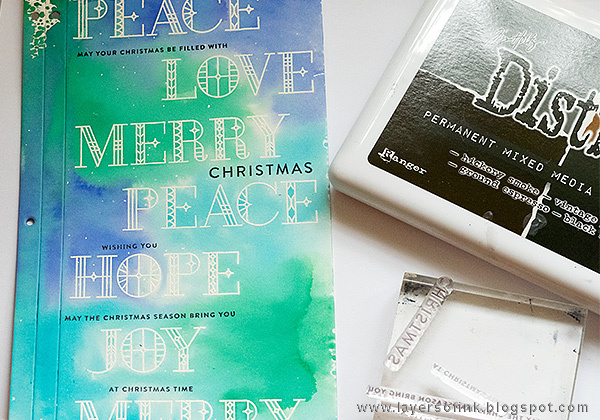 Christmas and winter crafting is a favourite of mine and I had such fun with the wonderful new products. I made two projects, and both are tutorials: a Christmas journal / notebook and a card. The journal could easily be turned into a card and the other way around. When I saw the stunning big words in the Stained Glass Greetings set, I knew I wanted to use all of them on one project and thought they would look great on the cover of a journal or notebook. This journal is quite quick and you could make it as a gift for someone, or use it to document Christmas memories, traditions, gifts or to-do lists. 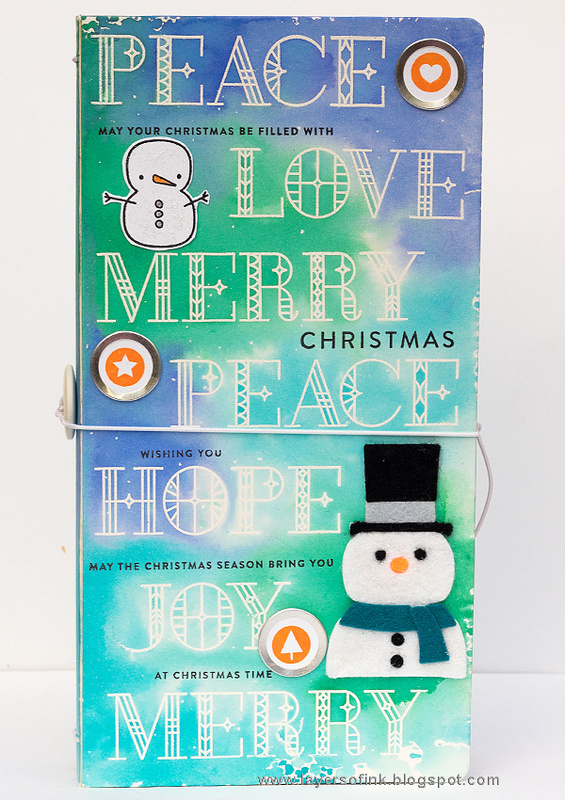 The journal was embellished with a Picture Book Snowman and stamps from the Merry & Bright set. 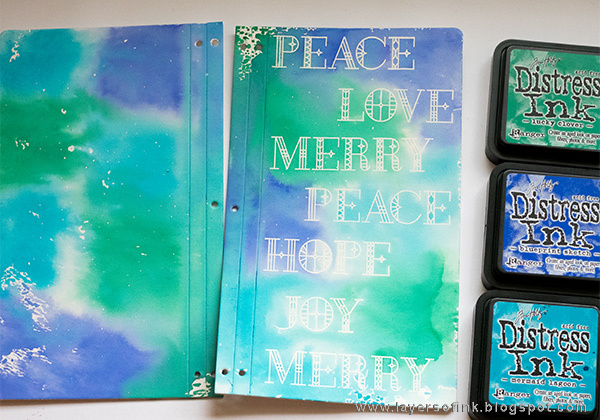 These are the two stamps sets that I used: Merry & Bright and Stained Glass Greetings. 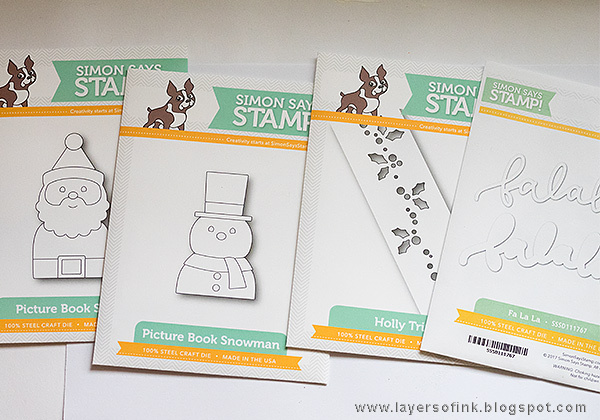 And these are the dies that I used for my projects: Picture Book Santa, Picture Book Snowman, Holly Trim, and Falala. I ended up not using the latter one, but was initially planning to use it as a sentiment on the card. For the journal I used Eileen Hull's Sizzix Journal die. The journal is 4.5 x 8.7 in big. Die cut two covers from mat board. The XL dies fits perfectly through the normal Big Shot or Vagabond, all you need is a pair of Extended Cutting Pads. White emboss the words on the cover. I stamped two of the words twice. Mat board takes ink beautifully and I wanted my cover to get a lot of color. Distress Inks were smeared on a non-stick craft sheet and misted with water. The covers were pressed into the ink. I loved the look of Lucky Clover here, a color I don't use often and should use more. I also stamped the background with some of the smaller sentiments from the Stained Glass Greetings set and one sentiment from Merry & Bright. 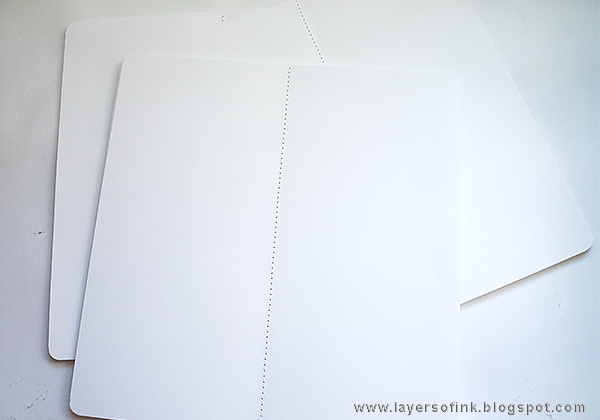 Cut 15-18 white or cream papers to 8.25 x 8.25 in (21 x 21 cm) and fold in half. Place them in three signatures with 5-6 papers in each and stitch down the center with a sewing machine. You can also use staples. Round the corners with a Crop-a-dile for a finished look. You can of course also use color or patterned papers, but I decided to keep this journal plain. I glued the spine together with Matte Medium, placing it under heavy books to dry. 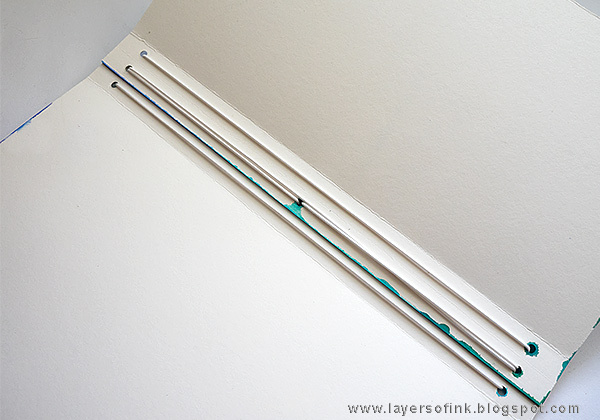 Use a piece of elastic and string it according to the instructions on the die packaging. You can also bind the books in other ways than this one. Tie the elastic ends through a button and tie again at the end to create a closure for the book. Slip the signatures into the elastic to bind the books. I like the fact that the signatures can be removed if needed. 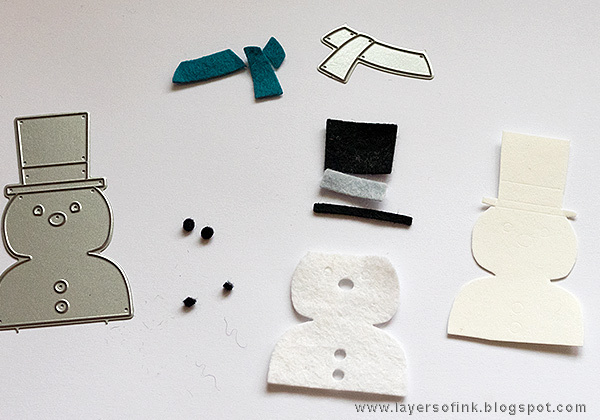 Die cut the Picture Book Snowman from SSS wool felt. 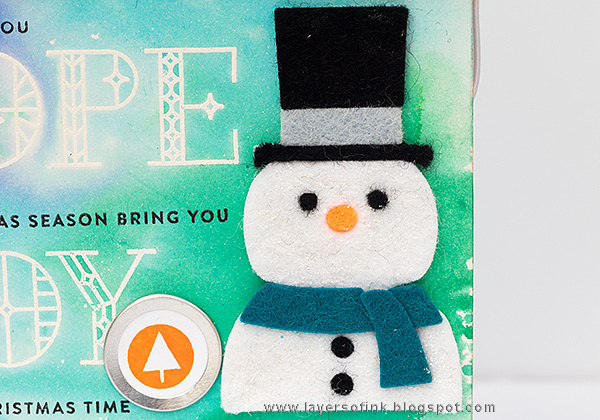 The snowman is easiest to assemble if you have a base, and I simply pressed the die into a piece of cardstock, pressing down the edges of the die to make an impression and cut out roughly with scissors. I wanted the snow to sparkle and added Frosted Lace Stickles to the white felt. It would be better to do this step before assembling the snowman. 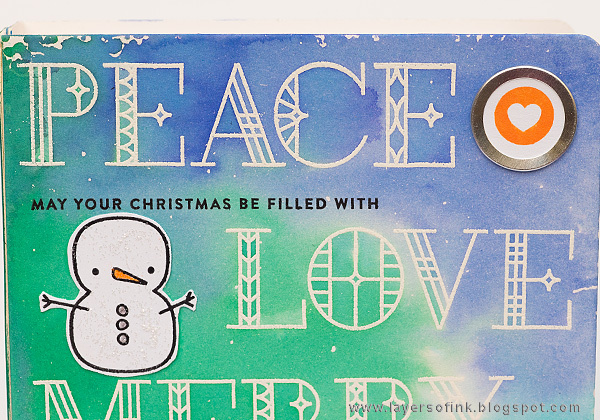 The small circular stamps on the Merry & Bright set fits great for Tim Holtz's smallest metal-rimmed tags. 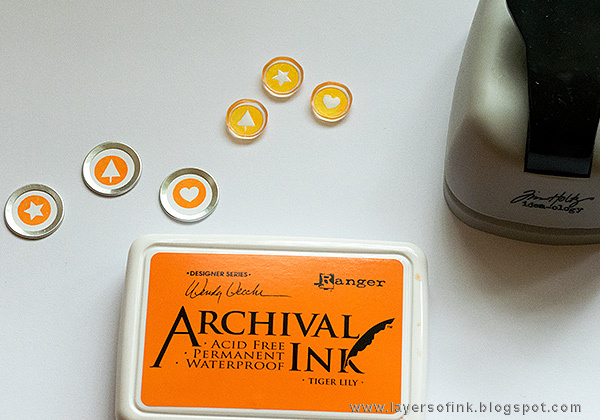 Stamp on white cardstock with orange ink. 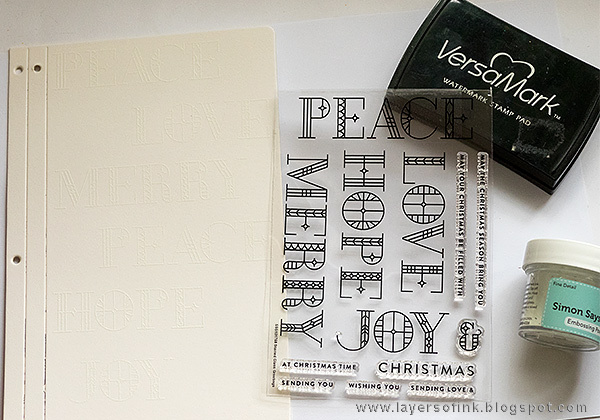 You can use the coordinating punches, or simply trace the tag on the paper and cut out just inside the traced line. 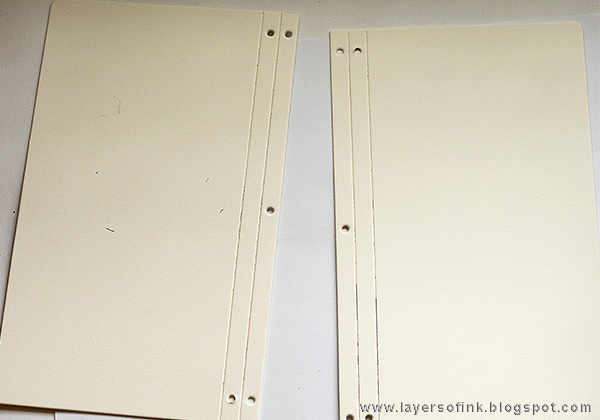 Press the tags in the Tag Press, to make custom metal-rimmed tags. 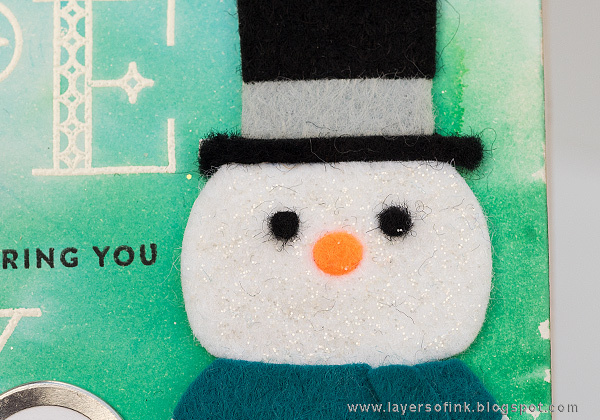 I also stamped a small snowman on white cardstock and added some color with pencils, as well as Frosted Lace Stickles. 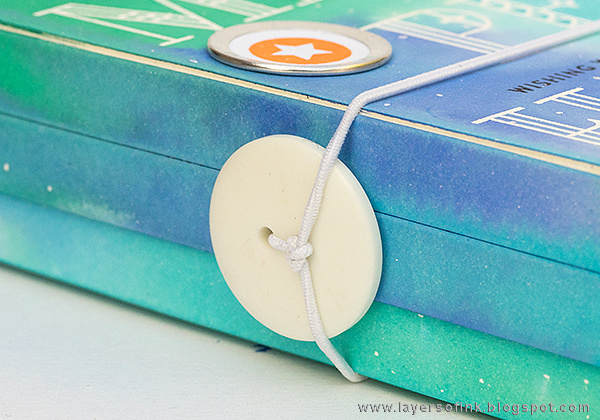 Glue the embellishments to the cover and your book is done. The combination of white resist letters and the black stamping makes for an interesting look, and is also easy and quick to do. I am fond of stamp sets that combine large and small sentiments, such as Stained Glass Greetings, since they are so versatile. You could make a card using just one of the big words, and adding one smaller sentiment to accompany it. 'Joy' is one of my favourite words - and not only for the holidays. I was happy to see more Picture Book characters, since I have had a lot of fun with the Picture Book Panda from the STAMPtember release (check out this card and this tag). You might see the sparkle from the glitter better here. 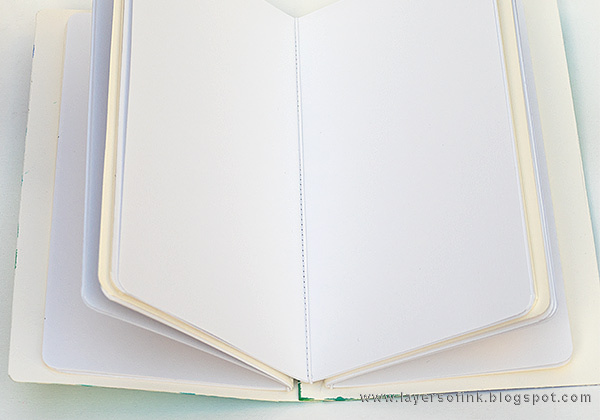 This journal has a nice chunky look to it, and is also quick to do. If you want more journal inspiration, I have made three previous journals with this die: Tree Sketch Book, Seaside Journal, and Alphabet Notebook. You could repeat the stamping on the back, or add something else there, but I decided to keep it plain. And since no holiday hop post would be complete without a Christmas card (and since I love to send Christmas cards), there is of course also a card. 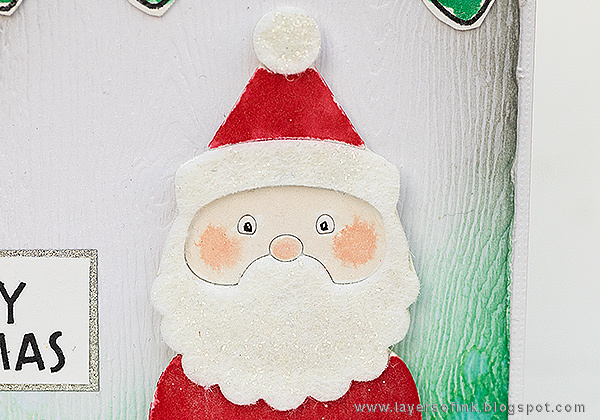 The star of this card is the Picture Book Santa and he can be made in different variations when it comes to surfaces and colours. I decided to keep him traditional here, in red clothes. This card sparkles much more than would you can see here. The Santa was die cut from watercolor paper, wool felt, black paper and paper covered with silver Deco Sheet (for the buckle). I added Frosted Lace Stickles to the wool felt parts. The watercolour paper parts were colored with Distress Inks, but I also wanted them to sparkle. Candied Apple and Tattered Rose Distress Inks were smeared on a craft sheet and misted with Mica Spray. I didn't use any water. The spray creates a sparkly effect. Pick up with a paint brush and color the hat, jacket and face. The same technique was used for the light bulbs, or in this case, baubles. The background is Tim Holtz woodgrain paper and it was first die cut with the pretty Holly Trim die, and then inked with Distress Ink. The Picture Book Santa is so cute and he would look great in grey or green too. The Santa was adhered with foam tape. 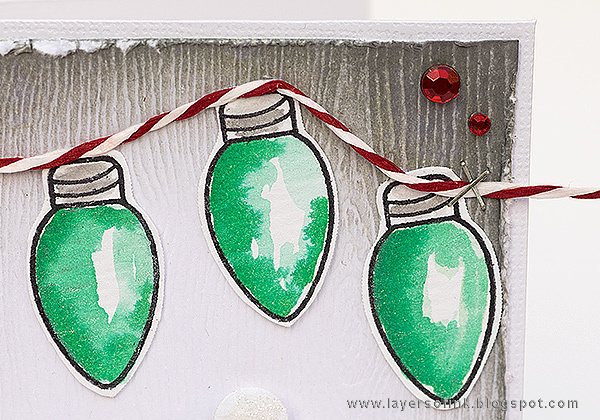 This stamp is versatile since it can be both a light bulb and a bauble. It would look great hanging from a stamped tree too. I placed a piece of silver Deco Sheet behind the woodgrain panel so that the silver shines through the Holly Trim die cut. Some red rhinestones were added as more berries. The effect of the Mica Spray is hard to capture, but you might see it better on this photo. There are of course also prizes to be won and Simon Says Stamp is giving away a $25 gift voucher on every stop on the hop. All you need to do is to leave a comment. One winner will be randomly chosen from each stop along the hop and will be revealed on the Simon Says Stamp store blog on Tuesday. 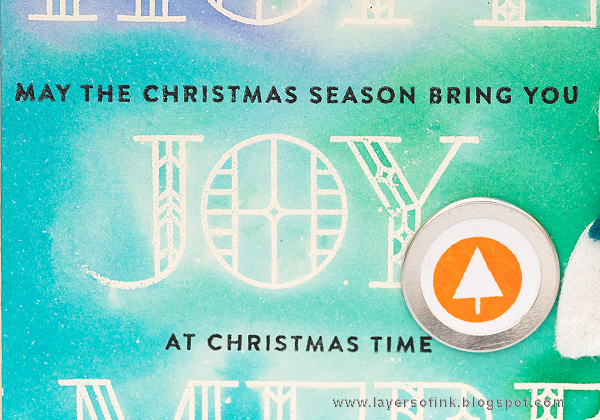 There will also be a second Making Spirits Bright blog hop tomorrow, with even more inspiration and prizes. Thank you so much for visiting here today! I hope you are inspired to start with your holiday crafting. The journal is fantastic - and I love the card, too. Thank you for providing such detailed how-to instructions! I was wondering how those Stained Glass Greetings would look. Thanks for showing those. Love your glitter holly and red gem berries. Fun card and beautiful journal. A Book! What a Great and Different idea. I could do a heavy weight "board" book for my 2 yo g'son using felt. I am also liking the word dies from this release. Really FABULOUS!!!! Love your journal!!! That journal is amazing! Your instructions are very easy to understand and I am going to check out your other journals. The journal is so awesome. Thanks for sharing. Love the choice of colors for the notebook cover. Fabulous. wow your journal is amazing and the card is so adorable. Great projects! I love how you've used felt with the dies too. I love the stained glass greetings stamps. Great cards! That is a really cool idea. Love it! What an amazing release, and I love what you created. What a gorgeous Journal cover - love how you used these new products! 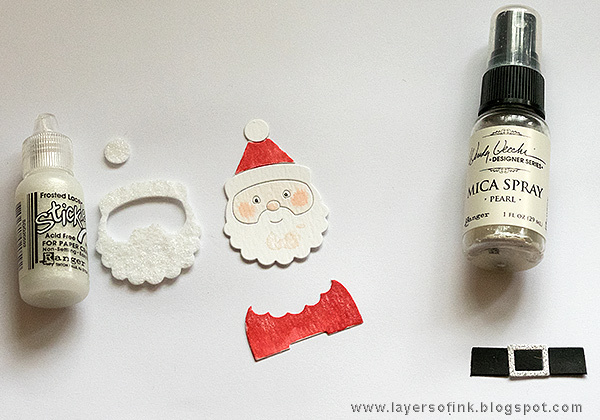 Awesome projects... the little felt Santa is so darn cute! The journal is absolutely beautiful! Love this new release. The journal is awesome. 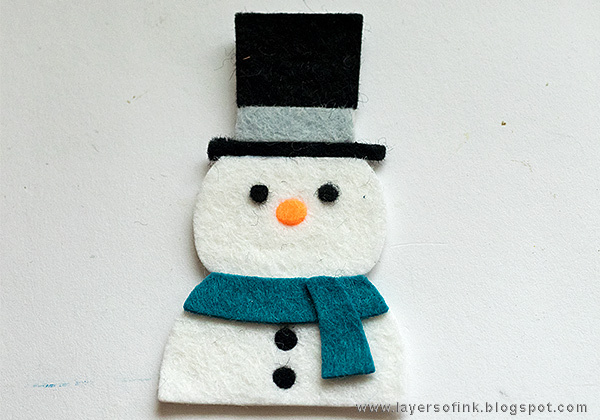 Really like how you made the snowman with the felt and stickles. Great creations!!! I LOVE your Journal, such a great idea that looks perfect with the stamps you used. Thank you for the beautiful inspiration! I just absolutely adore your Journal and your cards are just way to adorable!!! Your felt snowman is so cute! Thanks for the tip about using a cs base. Great idea for the journal. Very cool journal. Love that the set looks kind of Art Deco. Adorable journal. Love this new release. Those stained glass letters work amazing for this project! Wonderful tutorial! Neat idea to make a journal. Love the felt snowman. Thanks for the inspiration. Oh my!!! I love those two stamp sets!!!! They are amazing. Your journal and card are fabulous!!! Thanks. Ooohhhh I love the journal, what a great idea. When I saw it I also thought of a set of wood blocks to decorate my mantel with these wonderful words. Thanks for the inspiration. I love the journal idea! I think this would be so great to have the kids fill with memories and use as a yearly keepsake. Thanks for your inspiration! The journal is a great idea! Your use of felt with that adorable Santa -- perfection! I love the look of your journal and the card is just adorable! Great idea for a journal, love the colors! I love the journal such beautiful colors and design. Great card too! Love how the mica spray works with the bulbs. What a great idea as a journal. Just love the colours you used as well! 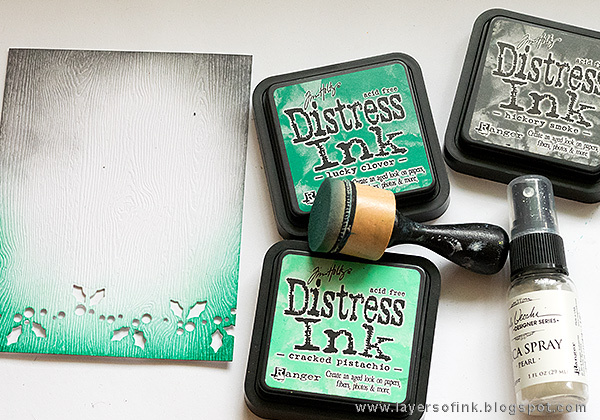 I love these blog hops to really see what these stamps and dies look like in use. The stained glass words are beautiful! I love that journal - it gives me great inspiration on how to present some Christmas photos to a friend - wonderful! Wow, I never had thought that making a book could be so easy. It is so nice to see how many ways these stamps can be used for different effects. The journal is very clever. Love the journal and the card. Great inspiration to make Christmas merry and bright! Great ideas! Loved the journal. Perfect Christmas journal/notebook! Love the colors you chose and the layout of the words. You broaden my horizons by making a journal. I never think of doing anything like that. Thanks for the inspiration. Ummm... I LOVE this! I have never seen this journal die before. I have tons of chipboard from a friend who does custom matting and ink and stamps and oh my word! I need to get busy! Such a great release! Love your beautiful book cover and your card. Great projects. Totally love your journal. What wonderful projects! I love your journal. I never even think of using felt with dies. Thanks for sharing. Love the snowman made out of felt. Will be using that idea. love the Snowman, the felt just makes it! I love the felt snowman... so adorable. Great idea about making the travelers notebook.. Wonderful journal and card! I love how our used all of the words on the cover. also good to know the dies cut through felt. Your journal is awesome! Thanks! I am in awe of people such as yourself who pay attention to such detail for a card or a journal! The colors are beautiful, and I especially love the stained glass images. All the little pieces of the figures are mind-boggling to me, so I appreciate seeing them! I love the snowman journal you made. Thank you for sharing. Oh what fun the holiday season will be, with this great little notebook to record the memories and traditions. Fantastic project! I love this entire release. Love the design of the journal. It would make a cute card or framed piece too. I love the journal - beautiful! The book looks so easy and really cute. Great way to help organize all the festivities. I love the holiday journal idea. I have journals for lots of different things, but never thought of this. Thank you for inspiration. Thank you for sharing you creative ideas. wonderful journal, Anna - and darling card! Super fun project. Love the picture book effect! I never would have thought of making a journal. Great idea. 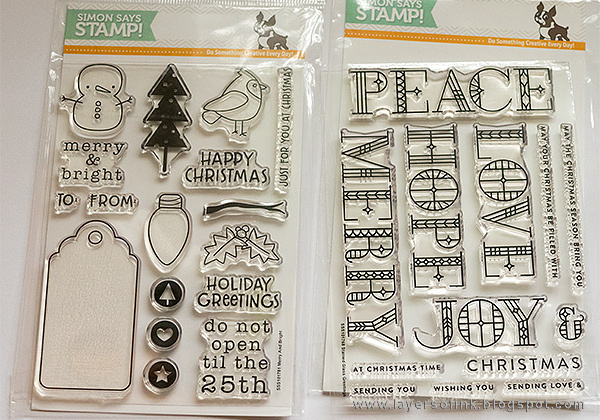 I'm drawn to the Stained Glass Greeting stamp set because the lettering is so different. Love the way you decorated the journal you made! 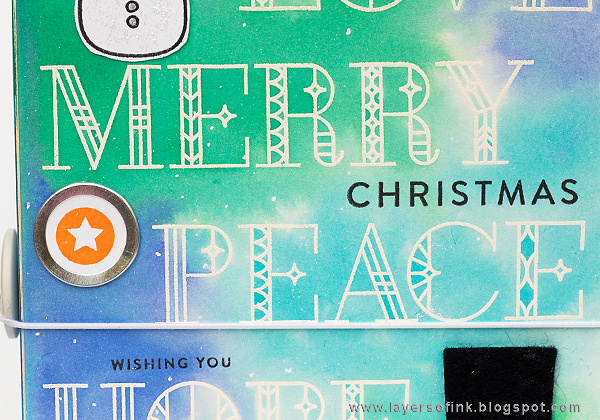 The Christmas Card is one of my favorite on this blog hop! All of these are way to cute! I love your creativity! Awesome projects, love that journal. great projects. thanks for the video. Love your card and journal--great release from SSS! 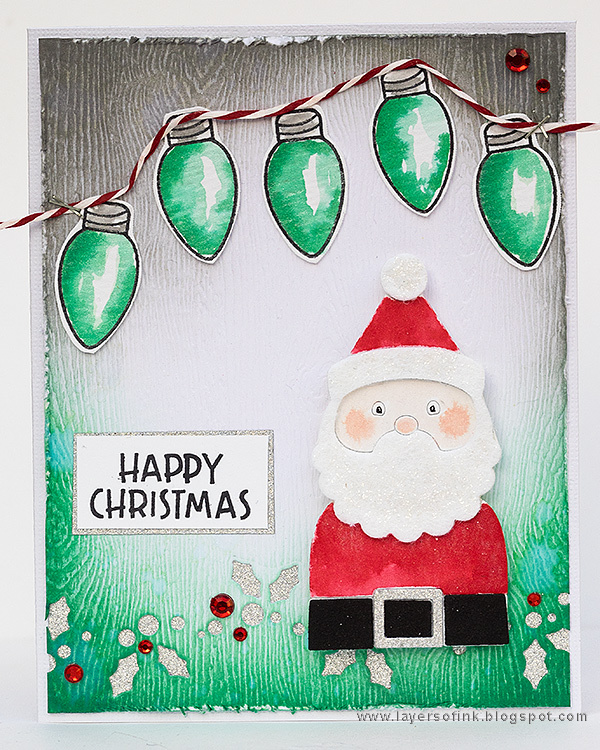 What great projects and your Santa card is beautiful. WOW the journal is gorgeous!! Just beautiful. I really like that shade of green. Thanks for the inspiration girl! 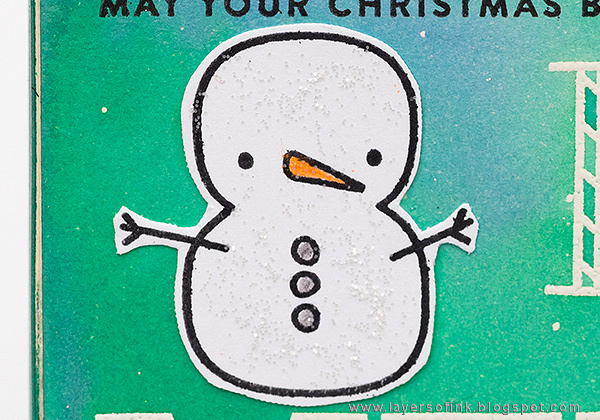 Love the felt snowman and use of the stained glass greetings! Love the journal idea and the texture on your card is the perfect touch! Thanks for the wonderful inspiration Ana! Love your journal and card! Thank you for the inspiration! I love your journal, those stain glass greetings are beautiful!! Your card is awesome! I love the colors and all the added details:) Thank you for sharing your creativity! Wow! Lots of goodness here! Thanks for sharing. Wow, great projects, just wonderful! What great projects you came up with. 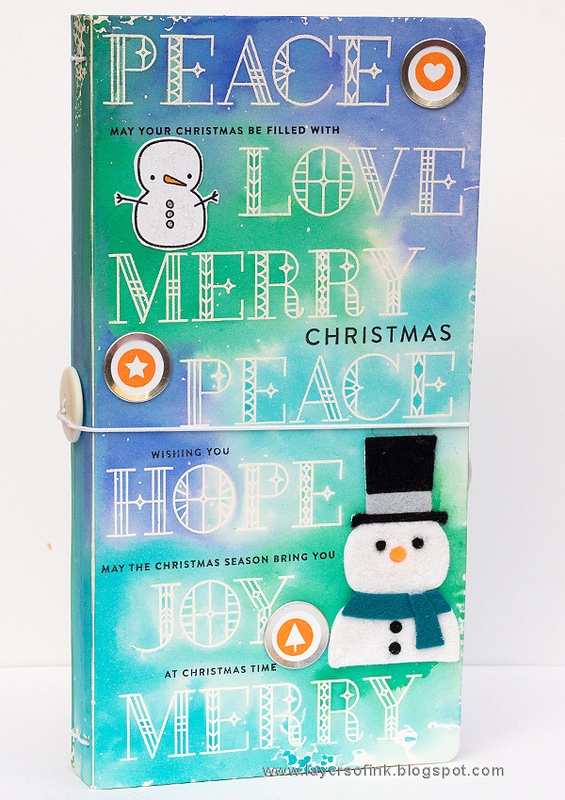 I love your Christmas Journal/Notebook and card! your journal books are quite the project. 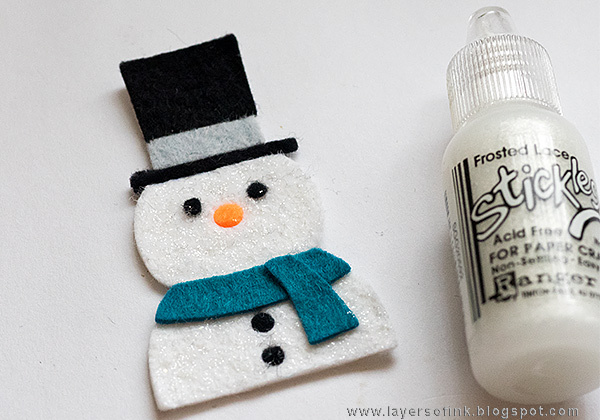 Great idea, I do not use the watercolor paper much but loved your wool felt snowman! Love your journal - great color combo. I absolutely love the colors and the woodgrain paper you used for that beautiful card. Such interesting projects! Love the Stained Glass words on the journal cover. You are a genius! I love your projects!! Love the awesome journal that you've created! That TN journal cover is genius! Thanks for sharing! Love the journal cover and those cute character dies! You did a LOT for this project and I love the outcome. This is so cool. What a wonderful keepsake for you or a loved one; very thoughtful. I want one! I love journals and yours rocks! Love the cute card too! What awesome projects. I love the Stained Glass Greetings. Wow, wow and then again, wow - all your creations are gorgeous. WOW your projects are amazing!!!! LOVE them and this awesome new release!! I applaud you for doing a different project vs cards/tags to inspire people to think out of the box. I so appreciate all the pix showing what you did to create this book. The Christmas lights have a very unique look..kudos to you for this!! This is just so clever and it really showcases the entire stamp set. The details really set it off too. Thanks for sharing. What a great journal. the picture book characters are so adorable. Such creative projects...thanks for sharing your inspiration! 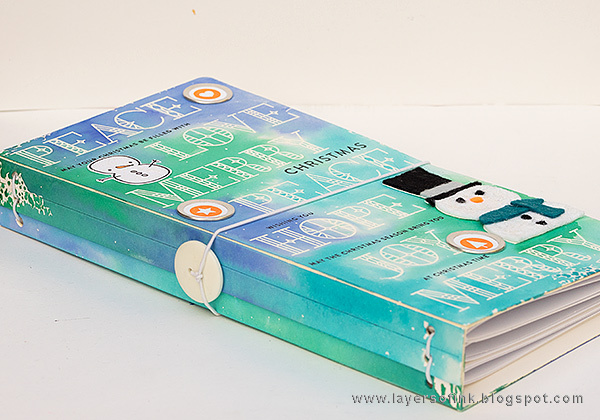 Such a cool idea to make a custom Christmas journal cover! I love it! I enjoyed seeing the details about how you bound it, and the elastic to hold it closed. I love the journal you created! The Stained Glass Stamps are so pretty! love your projects and the use of the mica spray! I am in love with this book!!!!! And the felt snowman!!!!! Both your projects are amazing. Love the felt snowman. I've never seen the journal die before - love the look of that die. Great projects. I've never seen how a journal goes together. Very cool!! I love the journal. What a wonderful gift idea! that journal is so great! Great colors and I like the use of felt. WOW love your journal---very cute card!!! These are two great Christmas spirit creations ! Thanks for the detailed tutorials. The journal is amazing, I like seeing other things you can do with card making materials that aren't cards. Amazing. WOW - you really created some stunning projects for this blog hop. I love everything about the journal. So fun to see something other than a card - but the color combinations you used are so beautiful! Thank you for sharing your art with us today! Love your notebook and card! The snowmen are absolutely adorable... my favorites! Fun projects! Like the use of felt for the fun images. Your projects are awesome! I especially like the journal. A terrific idea. Well done! Great journal and the card is adorable! Thanks for the instructions on the journal, love the color combo you used! The stained glass words are really unique, so pretty. Your journal is so creative and fantastic. Love the great Santa card, too. The journal is spectacular, and the card is fun, too. Thanks so much for sharing! Beautiful journal and card! Thanks for these great ideas! Wow! Pretty journal, love your colors & texture! Stickles on felt, mica spray on ink on craft sheet, thanks for all of your details, so inspiring!! The journals is just stunning! The Stained Glass Greetings set is one of my absolute favorites! The journal with all of the stained glass sentiments is wonderful and all comes together with the snowman and Santa. Throw in your beautiful card with the journal and you have a great last minute, festive gift and a pretty handmade card. Two gifts in one! Ooh! I'd love that journal. Santa, I've been really good! Thanks for sharing these beautiful projects and for the wonderful "step by step" guide. Your journal is stunning (and then some!). You are such an inspiration! Amazing Christmas journal, love the stained glass words and your super cute santa card is so festive too! Lovely projects! Great journal and card. Love the picture book dies and the holly border. Your cards were darling. The journal you created is stunning! Lucky clover was the perfect shade of green for the cover. Thank you for the step by step photos! I am in love with your journal! The picture book dies are so cute and stained glass letters are gorgeous! Thanks for the tutorial but I would rather have the one you made...lol! Wow..ur Inking is the Bomb. Im a sucker for Snowmen.. But that card is so stinkin cute too! Such a cute snowman and Santa! Love this release! So pretty! 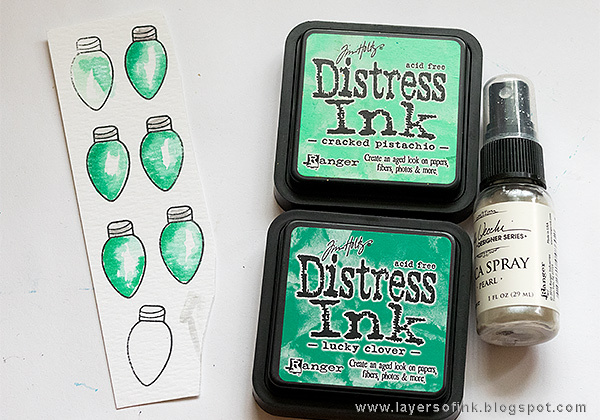 I've made a mental note of the Distress Ink combo! Great job! I love the way your book journal turned out. I've put the stained glass set on my shopping list. Thank you for the inspiration. Wow!!! What a lovely idea for keeping in the spirit!! And this is a perfect project to keep or giveaway!!! Great job... Idea for photographing the mica spray, try to speed up your shutter speed, less blur, and tilt card back and forth, allowing the light to bounce off the spray... just an idea, don't know if it'll work.., great job though!!! Both the journal and card are delightful! Love your Journal cover ... brilliant idea mixing the two sentiment stamps ( and contrasting colors ) and mixing techniques ! WOW! So beautifully done! I love the colours you used, and the design is fantastic. And that felt addition is also great! Love the book/journal. It would make a great "idea file"! Thank you for this one! Thank you for sharing your talent !! Beautiful card! The book is an amazing piece of art! wow- I am in love with your gorgeous journal!! Great card too. WOW! That is an impressive journal! Awesome card too! What a great tutorial Anna-Karin. I love your journal and card, a beautiful job on both. (I have to show this to my sister, she LOVES making/binding books.) TFS! I love the font of the Stained Glass Sentiments, and your journal is just fabulous! WOW your project is amazing, and I love that you have shown us all the detail;s on how to reproduce it. I just love how each blog creates something completely different. You are all so inspiring! I love that snowman. I think he will be coming to my house soon! Your journal cover is beautiful! And that snowman! Oh my goodness!!! Both your projects are really stunning and so cool!!! Love them!!! I LOVE both of your projects. The journal is so amazing and I love the use of felt. And your card has so much artistic detail... I adore it!! Goodness you are super creative! Love all these ideas! Wow, your journal is awesome! The Stained Glass sentiment set is my favorite of the release. And I love the snowmen! Your card is darling as well. wow, these are both amazing! love the ideas and the colour pallets. thanks for sharing! Your projects are wonderful. The journal cover would be great framed and hung on a wall, too. The journal is really nice. Love the colors. Thanks for sharing. Amazing journal - love the colors you've used! I love your fun Christmas book idea! This looks easy to do that I will give it a try! Thanks for the inspiration! Cute ideas, excellent instructions! Thank you! Really like these items. Great instructions. Thanks. That book is amazing - love all the colors! Love your creations!! I love the colors you have used for the journal cover. The Christmas card is lovely. Your card is so cute and wonderfully colored. Love your journal, what a nice gift it would make for a special friend. TFS! 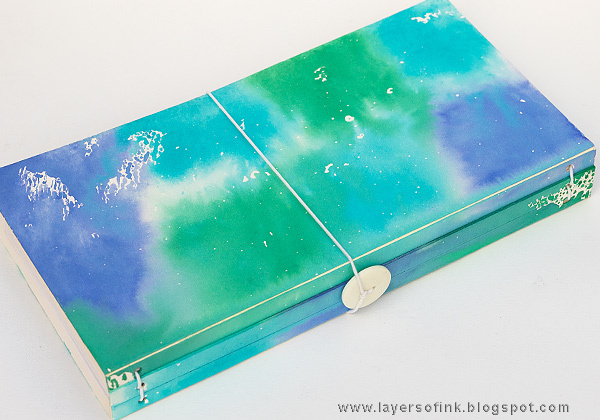 What a beautiful journal book and I love the colors you used - so wintry and perfect! The snowman adds such a beautiful touch and the sentiments are perfect. Thank you for the inspiration today!